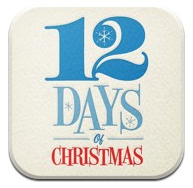 My favourite festive app has to be the the 12 Days of Gifts from iTunes. I join in with it yearly without fail. It's so simple, every day from the 26th December to the 6th January iTunes give you the chance to download a free gift. You have 24 hours to claim the gift before it changes to a new one. Over these 12 days you get the opportunity to get free songs, apps, books, films and games. I still have songs and apps now that I downloaded from the 12 Days of Christmas from years back. They're still useful to me and that's what I love. The other thing I think is great is that you can decide daily if you want to download the freebie, if you don't like Coldplay you don't need to download a free copy of their latest song for example. In the 12 days there is something to interest everyone. Not everyone appreciates it but I say, "it's the thought that counts people!". Make sure you download 12 Days of Christmas in order to get a few nice freebies from iTunes. This is my entry into the Forever Family competition to win an iPad Air.